Cardioversion is a quick, corrective, procedure where an electrical shock is applied to the heart to convert an abnormal heart rhythm into normal sinus rhythm. Elective or “non-emergency” cardioversions are mostly performed to treat atrial flutter (AFL) or atrial fibrillation (A Fib), non-life threatening abnormal rhythms that originate in the top portion of the heart. Cardioversion has also been used in emergency situations as well, to correct an abnormal rhythm when it is accompanied by low blood pressure, difficulty breathing, chest pain, loss of consciousness or faintness. A normal heartbeat starts as a single electrical impulse that originates from the atria. The impulse emits an electrical pulse that enables the atria to contract and move blood into the lower ventricles. Next, the electrical current passes through the AV node (the electrical bridge between the lower and upper heart chambers), causing the ventricles to contract and then relax in a rhythmic, steady sequence. This allows blood to be drawn into the heart and pushed back out to the brain and body. 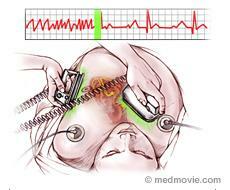 When AFib occurs, the electrical impulse doesn’t follow this sequence. Instead of a single impulse moving through the heart, many impulses begin in the atria and one of them gets through the AV node. 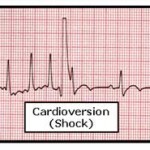 This causes the atria to fibrillate or quiver and typically results in an irregular, fast heartbeat. While some people won’t have any symptoms, others may experience fatigue, shortness of breath, and lightheadedness. Depending on your medical history and symptoms, your physician may suggest a cardioversion to return your heart rhythm to a normal sinus rhythm. 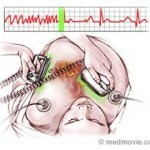 Chemical cardioversion – Antiarrhythmic medications are used to restore the heart’s normal rhythm. 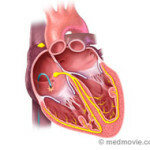 Antiarrhythmic medications work by modifying the flow of electricity through the heart. Depending on underlying heart disease, the specific medication to be used and the severity of symptoms, the chemical conversion may be done in the hospital or as an outpatient.